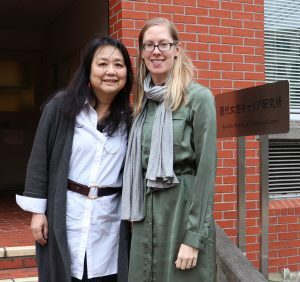 Prof. Machiko Osawa, Director of RIWAC, got interviewed by Ms. Pamela Boykoff, Journalist and Abe Fellow, about daycare shortage and working mother. 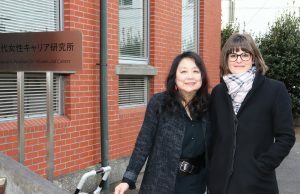 Prof. Machiko Osawa, Director of RIWAC, got interviewed by Ms. Ingrid Jacques, Deputy Editorial Page Editor of The Detroit News. RIWAC’s 10th anniversary symposium was held on Dec. 8th. The theme was “Promotion of Women’s Participation and Advancement in the Workplace, and Work-style Reforms”. It was successful and fruitful with around one hundred participants. Panelist Lectures and General Discussion with answers to questions from the floor were held by Prof. Emiko Takeishi, Ms. Yoko Yajima, Executive Officer of Mitsubishi UFJ Research and Consulting, and Prof. Machiko Osawa. They were also carrying out discussion about both practical issues and their solutions. Prof. Machiko Osawa, Director of RIWAC, got interviewed about current situation of women’s empowerment by Ms. Marie VASTEL, Parliamentary correspondent in Ottawa. Prof. Machiko Osawa, Director of RIWAC, got interviewed about work-life balance and labor market policies for women by Ms. Ana Cvetkovska Toromanoska, Macedonian Information Agency(MIA). 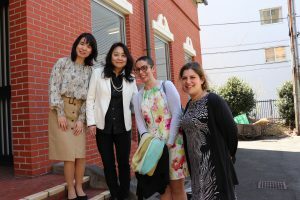 Prof. Machiko Osawa, Director of RIWAC, got interviewed about gender equality and family outcomes in Japan by Ms. Mara Gergolet, a newspaper reporter of Corriere della Sera issued by RCS MediaGroup S.p.A. The 4th “women-only gathering” jointly sponsored by Tokyo Woman’s Christian University Empowerment Center and Research Institute for Women and Careers was held from 7 p.m. on July 13, 2018, at Omotesando Nasic Hall. During the first session, Yumiko Kamada delivered a talk on “Just Do It”. She graduated from Japan Women’s University and at first she had worked at East Japan Railway Company and worked on a new model from the environmental plan of a station to merchandising and now an executive officer of Calbee Inc.
During the second session, a casual networking meeting was held with beverages and snacks. The participants were almost 50 people, and they had a good time there and hoped the next gathering. This gathering started as building a network of the alumni beyond generations and has been gradually established. Associate Prof. Naomi Kodama reported her latest research about a merit system and impact of WLB policy on gender disparity with using quantitative data analysis. After the report, we held active discussions with the participants. In population declining society, women’s labor participation is considered indispensable. In the workplace, expectations for women are increasing more and more due to lack of human resources. However, the proportion of female managers is still low and women are said to be reluctant to become manager. The Symposium theme is “Why don’t women want to become managers?” and we think about its cause based on research results of psychology and sociology and also have a view of new leadership image beyond gender difference. Emeritus Professor Michiko Homma of Japan Women’s University gave a Keynote Lecture on the theme of “Why don’t women want to become managers?” Based on the research of social psychology, she gave us her presentation about the problems of women’s leadership (motivation for promotion), leadership conformity, and new leadership oriented in social changes towards a new era. Two panelists reported on the theme of “Why don’t women want to become managers?” based on the research of sociology and on that of social psychology respectively. Prof. Nami Otuski, University of the Sacred Heart, gave a lecture about “Management intention of young adult men and women segment”. She reported the reason why Japanese enterprises have a low number of female managers, and some research results about management intention of men and women getting a job in an employment ice age, and also about that of new employees (the first year and the second year after joining a company. Prof. Kiriko Sakata, Hiroshima University, gave a lecture about “Psychological and social factors refusing women’s promotion”. She reported some factors refusing women’s motivation for advance and some issues to heighten women’s motivation, and effectual leadership. At the end, the General Discussion started with answers to questions from the floor. The above Professors and Coordinator, Prof. Machiko Osawa, Director of Research Institute of Women and Careers gave detailed answers from their own respective viewpoint.